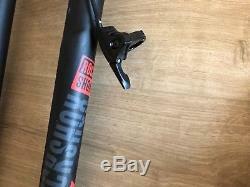 Only victory counts: the SID World Cup suspension fork by RockShoxSID World Cup has one focuswinning XC performance. The chassis and internals have been specifically engineered for 100 millimeters of travel. SID now features our highly acclaimed Charger Damper, optimized for the hard-pedaling needs of dedicated competitors. Torque Caps provide incredibly accurate steering. Specifications:Application: Cross CountryWheel Size: 29" Type: airTravel: 100 mmSteerer Tube: 1 1/8" - 1.5 taperedAxle Type: thru-axle (15 x 110 mm)Brake Mount: disc PM6 (direct mount 160 mm)Technical Information:Offset: 51 mmSteerer Tube Length: 150mmSteerer Tube Diameter (Stem): 28.6 mmSteerer Tube Diameter (Crown Race): 40 mmAxle to Crown (mm): 506 mmOver Locknut Dimension: 110 mmStanchion Tube Diameter (mm): 32 mmSteerer Tube Material: aluminiumCrown Race Material: carbonStanchion Tube Material: aluminiumLower Tube Material: magnesiumAdjustment Options:Compression: 2-Position Adjust (open with low speed compression adjust, lock)Rebound: yesSuspension Stiffness: air pressure adjustRemote: yes (OneLoc)Travel Adjustment: noApproved For:Tyre Width max. : 29 x 3.2 Rotor Size max. 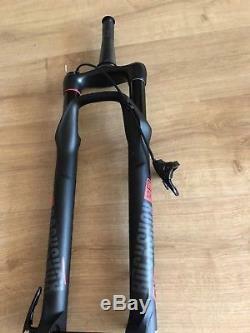 : 220 mmFeatures:- DebonAir technology- Charger 2 damper- Boost version- OneLoc remoteModel Index:100 mm / 1.5 tapered / 15 x 110 mm:- Travel: 100 mm- Steerer Tube: 1 1/8" - 1.5" tapered- Brake Mount: disc PM6 (direct mount 160 mm)- Axle Type: thru-axle (15 x 110 mm)- Factory Number: 00.4019.916.003Contents:- 1 x RockShox SID World Cup DebonAir suspension fork- 1 x RockShox OneLoc remote (right)- 1 x RockShox Maxle Ultimate, 15 mm thru-axle. 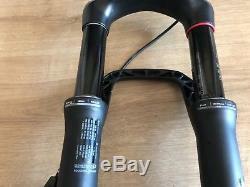 The item "Rock Shox SID WC worldcup Boost 15x110 travel 100mm offset 51mm 29/27.5" is in sale since Monday, October 29, 2018. 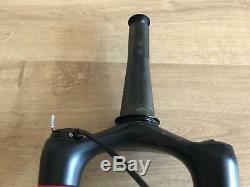 This item is in the category "Sporting Goods\Cycling\Bike Components & Parts\Forks". 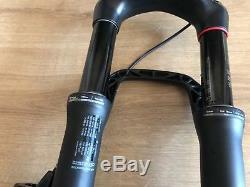 The seller is "rare-cycles" and is located in Nida. This item can be shipped worldwide.